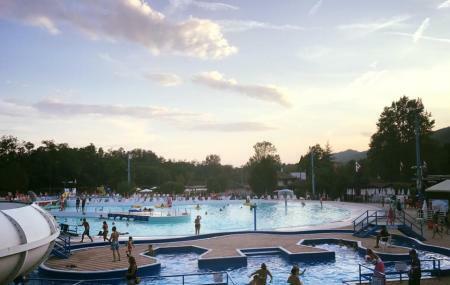 Parco Acquatico Bolle Blu is an amusement park packed with a variety of activities that are suitable for all ages. The water has three swimming pools that include an olympic pool for adults and a tiny pool for kids. The remaining pool is offered to those who want to learn swimming. You can enjoy your time gliding down the many slides at Parco Acquatico Bolle Blu and finally take a plunge in the clean pool waters. Experience the thrill of being pulled in by water currents in Torrent River - a prime attraction of the park. You can also rent the sun loungers at a minimal price and lay down to relax for a while. There is also a huge playground that effectively keeps the kids engaged. The playground is engulfed in lush greenery and is well maintained. Recent additions to the park include 3 beach volleyball courts that you can avail if you are up for a game of volleyball. The place is highly supervised by vigilant lifeguards who look after the security of the place. Visit this water park with your friends and family on a weekend to unwind yourself. Create a customized plan for your visit using the Borghetto Di Borbera trip planner. You can use ready templates or start from scratch for the same. Hotels like Albergo Verdi, Il Portico, Stevano Albergo E Ristorante and Hotel Motel Flower will solve your problem of where to stay in Borghetto Di Borbera. There are plenty of ready-to-book Borghetto Di Borbera vacation packages available that will cover the major attractions, accommodation concerns including the prime one like how to reach Borghetto Di Borbera. Love this? Explore the entire list of places to visit in Borghetto Di Borbera before you plan your trip. Fancy a good night's sleep after a tiring day? Check out where to stay in Borghetto Di Borbera and book an accommodation of your choice. This one is a nice Water Park. It is not very big, so it is easy to go from one side to another without losing much time, the slides are not that big, but fun enough. The queue during the week days is alright. You may wait up to 10 minutes to go down on a slide, but it is quite fast. What I liked is that there is a big garden all over with some palms and trees where you can lay down and relax. I strongly recommend you to come to this park after 14.30, which will cost you (as an adult) 13€. Family friendly water park with mostly Italian clientele. They arranged dance sessions with DJ and crew, which was popular. Fun slides for big and small. Shallow and deeper pools. Wave pool and artificial river. You’re obliged to pay a few euros for sun beds and parasol, but not a lot. Friendly staff, a bit chaotic restaurant. Well worth a day trip.